Tulips are among the most sought-after flowers because of their stunning beauty and the wide array of beautiful hybrid colors and presentations that can be cultivated. At the same time, though, they tend to be biennial, and sometimes even go three years before returns. 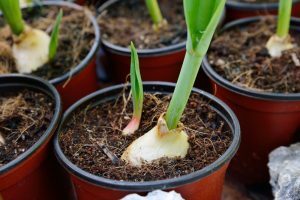 This leaves the bulbs vulnerable to predators and to damage from the weather, and it leaves bare spots in your garden during the dormant years. While gardeners have found ways to make them work in gardens, it is far easier to deal with them if your tulips are in pots. Tulips tolerate close proximity very well, so you can easily pack them in very close together. This makes your pots lighter and fills them with flowers so that their color really pops out during the height of the bloom. It’s also a good idea to put a grade over them, to help keep animals out. This is one of the steps that is just easier to handle in a pot than in the ground, too. For Americans who live in USDA zones 4 through 7, an unheated garage will keep your Tulips safe over the winter, providing the climate they need to thrive while sheltering them from the elements. The biggest advantage to growing tulips in pots is that you can keep the color going for longer, and you can keep tulips blooming every year by rotating through different batches. Keeping track of each container and its bloom time is easy if you note when each pot is prepared. A notebook or journal is a great way to track each batch and make this process easy. Having beautiful tulip varieties bloom every year is a challenging task for any gardener, but if you plan things the right way and keep track of your timing, planting tulip bulbs in pots does make the process easier in a number of ways. It also gives you the opportunity to make more of your garden space.